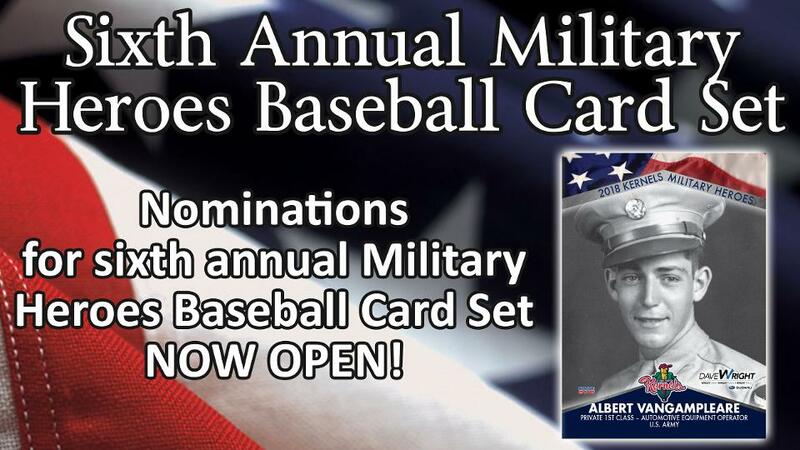 Cedar Rapids, IA - Nominations are now open for the Cedar Rapids Kernels sixth annual Military Heroes Baseball card set. The card set will represent each branch of the military and honor those who are currently serving our country, veterans who have served in the past but are no longer active, and those who bravely fought for our country, but have since passed away. Nominations forms are available by visiting the Kernels offices during normal business hours, or online by clicking here. Nominations can be submitted online by clicking here, mailed directly to the Kernels offices or dropped off at the stadium during normal business hours. Please include a photo of the Military Hero with your completed nomination form. The first 30 submissions will make it into the 2019 card set, so we urge people to turn in their nominations right away. Nominations will be taken until Thursday, January 31st, OR, until 30 submissions are received. To give all past and current military the opportunity to be honored in the Military Heroes Card Set, we ask that those veterans included in card sets from 2014 to 2018 not be nominated. The card set will be given away to the first 1,000 fans that enter Veterans Memorial Stadium on Thursday, July 4th, 2019. Those military heroes selected to appear in the card set and their families will be honored on the field following the July 4th game, and will receive four tickets to that game. For more information on the Military Heroes Baseball card set, or to access a nomination form, please contact Andrea Brommelkamp at (319) 896-7603 or by e-mail at andrea@kernels.com.